Laundry cottage is a two storey holiday home nestled in a leafy courtyard in Acharachle. Settle down for the evening in the cosy living room in front of a real fire. With comfortable seating for six, freesat TV and a DVD player – it’s the perfect place to kick back after a day in the country. 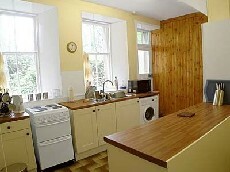 Like all good country homes, the kitchen in Laundry Cottage is the hub of the house. Huge, airy, warm and light with modern equipment, tasteful decor and all the pots, pans and crockery you’ll need to make your self-catering holiday a success. The kitchen table is large enough for all and we even provide a highchair for the little ones. There’s nothing like a long, luxurious soak in the bath after you’ve been stomping around the hills or playing on the local beaches all day. The bathroom at Laundry Cottage is a peaceful haven where you can wash away the day with a large victorian bath and electric power shower. The Master Bedroom is sunny and airy, with views over the surrounding woodland. Huge bed, high ceiling, freshly laundered linen and modern decor. Bedroom Two is slighty smaller but still very large, with period features, dark wood bed and large walk-in wardrobe. Cosy, warm and welcoming. The twin room – ideal for children, but anyone would be delighted to sleep here. Sunny, airy and comfortable – with enough room to play.